About: Join Rodný Kruh (‘Native Circle’ in Slovakian) in their annual Summer Solstice celebration. The event includes 3 days of traditional Slavic festivities with special summer solstice rites, music, singing, dancing, and many other activities. The ceremony will be in Slovakian. Dress Code: The Rodný Kruh community has a special dress code for their traditional ceremonies which involves natural, folk style clothing. Visit Rodný Kruh’s new website for images of their 2013, 2014 and 2015 celebrations to get an idea of what to expect. 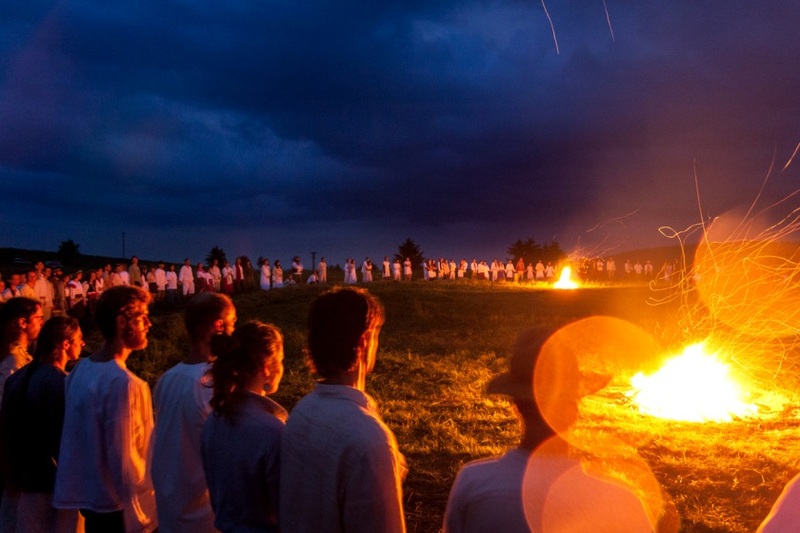 Below is a snippet from Rodný Kruh’s 2015 Summer Solstice ceremony in Slovakia. sunrise in your heart, peace and blessings to all. I think that is lovely to pay attention to the ceremonial clothing. I agree that it helps the atmosphere by perhaps evoking a sense of the past and its pure ways, and helps to feel like you are leaving the city and mundane life behind and puts you in the mindset of entering the presence of the spiritual. The colours have an effect on our psyche too, so wearing more earthen natural colours helps to calm the mind. I love linen as a fabric, it feels simple and yet somehow rich and deep, like there is a subtle beauty to it (perhaps because of the big amount of work that goes into making it.) Like some people mentioned I have also seen that when you make the clothes by hand with care and consciousness, you imbue them with something spiritual, and it is a big difference to commercial clothing. It feels much better to wear the handmade things, especially for spiritual ceremonies. I personally have a white linen dress reserved for the purpose, sewn by a small company according to a traditional pattern, and somehow it takes me closer to myself. Thanks for sharing Vidimír! lot of things could evoking in each one many things.. anyway what we are doing is cutlture useful for these days, based on our roots. Culture where someone can fell Mother Earth or pure wather as well in the city. exist in the city or in the mountains or anywhere with good feel with respect to nature.. It is for me very hard explain something spiritual in english as it is (with all respct) one of the most worst language for this purpose..
..it is nice that people like our clothes, lot of them were made by ourself- it is new fasion based on our traditional clothes – some of the fabric used for shirts are up to one hundred old flax.. The main reason why there is required “non-bought” clothes is cose soul is as well not from a shop. And when someone prepare himself from outside, usually prepare himself aswell from inside.. So the sunrise can be done as well in his heart.. Thank you for sharing the meaning of the clothing Vidimir. It is a beautiful analogy of purification and inward preparation. It would be wonderful to take part in an event like that, with so many people gathered & committed to the same preparation. a hundred year old linen shirts! That shows how things made with care and love last, compared to the culture of plenty, cheap and disposable we have now. I’ve made one robe for myself by hand which I wear for special occasions and keep adding to it, and it really feels special. It’s true, when we prepare ourselves outside also something happens within. Wishing you a very special celebration! in these days language we can say flax is antibacterial and non-allergic material, when someone wash it in clean creek and dry it on the sun and liltle bit dry with wather the material go naturally to brighten… but it is very work-intensive to made flax..
many thanks for wishes.. bless your steps..
It’s also one of the most healing things to take internally … and has the most beautiful blue flowers … a real gift! Thank you for sharing. This is really beautiful. I can feel that this harmony between humans and nature is no longer the exception. And wearing these clothes, it looks like a journey through a lost past, through purity… where people coexist with nature in concord. Very beautiful celebration, thanks for sharing! This looks so beautiful! And spending three days in nature focusing on celebrating the sun and the solstice time should be a really spiritually uplifting event for all involved. I partly want to go to get myself dressed in those charming folk clothes! It does make a difference to the visuals of the whole event than if people were in a mish-mash of colours and styles. Just wanted to say I was very impressed when I found out about this group, as they seem to put so much emphasis on the beauty and folk-style of their celebrations. The main organiser of this event is a person who has been tirelessly trying to bring back the ancient heritage of the old Slavs since the fall of socialism in 1989. He also wrote a lot on the Sun and its importance in the spiritual life of the Slavic people and even developed a series of visualizations and contemplations of the Sun for people to practice. It just amazes me how people sincerely searching can be guided from within to uncover the long lost spiritual principles. The interesting thing about their fires is that they actually light 5 fires in the evening, 4 in the cardinal directions, and one in the middle, which symbolizes the middle of the cross and is lit as first. Thanks Lucia for sharing your information and the photos of this group. They all seem to be experiencing the joy of their celebration.